I drove to Yosemite yesterday. It was 8 hours of driving for about 6 hours in the park but totally worth it. 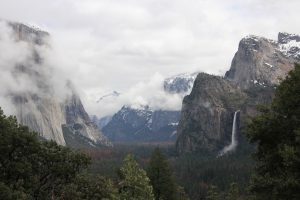 Rose had mentioned a while ago that she was interested – apropos the NPS 100th anniversary last year – in seeing National Parks, so I asked her a couple of weeks ago if she wanted to see Yosemite. She was thrilled with the idea but as it came closer I was not so sure. There was a big storm predicted for Sunday in the evening and I had to work (1 am) late the night before. We went anyway and it worked out great. It was cloudy all day and we only got rained on a little. I took pictures but for the most part they were crappy. Our first stop was the Tunnel Overlook where busloads of tourists emulated Ansel Adams. Here’s my version. Later at the Ansel Adams store I bought a post card with his version. I’m not going to put it here. We tried to go at least to the bridge below Vernal Falls but the parking lot was full. 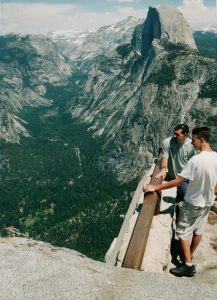 Yosemite Falls’ trail was severely reduced due to ice on some of the foot bridges. 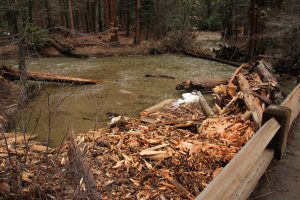 Everywhere we went, there was evidence of the recent flooding. 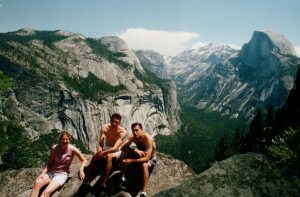 This is just below Yosemite Falls. Finally, towards the end of the day, we made it back to Bridalveil. I hadn’t gone in there earlier because that parking lot was full. Rose finally got the experience of getting slammed with spray from a big waterfall. There’s nothing like it!